So you’ve always thought you could do better than the local TV weatherman, if only you had the chance? Well, here’s your chance! 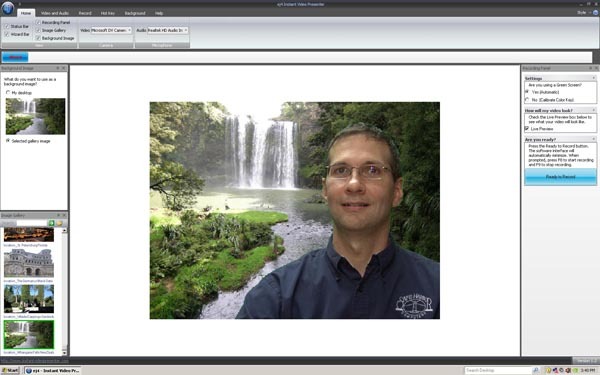 Instant Video Presenter from ej4 allows anyone with a PC and a camcorder or webcam to superimpose themselves over any still image background, or whatever is on their PC screen, such as a PowerPoint presentation or photo slideshow. There are a handful of backgrounds included, or you can choose your own images. All you need to do is sit or stand in front of a green screen (5’ x 7’ green cloth included), point the camera at yourself, run Instant Video Presenter, and you’re in business! IVP is perfect for non-video people, like real estate agents, salespeople, trainers, etc., that need to get their message across quickly without learning complex programs or hiring a video production crew. The software took just a couple of minutes to install, and is so easy to use that I had immediate results without reading the directions. My DV camcorder was automatically detected and I saw my own face live and onscreen in the IVP interface. I chose one of the many supplied background images, hit “Record” and produced a video of myself “live” in an exotic location. As with any green screen software, lighting is critical to achieve quality results. In some situations, you may get a decent key right off the bat, but plan on adding some additional lighting for best results in most cases. The ej4 website offers several free training tutorial videos dealing with this and other issues which I found very helpful to tweak my results. IVP is somewhat unique in its function and purpose in that it allows the user to superimpose him/herself over the computer screen, on the same PC running the IVP software. Once you hit the RECORD button, the IVP interface is minimized and you can run your slideshow or application on the PC screen. Just push a user-selectable hotkey to begin recording once you are ready. It works well to place the camera just above the computer display, with you facing both, so you can watch the screen and position yourself accordingly. Videos recorded using IVP are not meant to be edited. In keeping with the “instant” part of the name, users choose from one of four quality presets before recording, do their presentation, and upon completion, the video is done and ready to email, upload to the web, or burn to CD – no additional encoding is needed. Of course, if you do wish to edit or add titles, that can be done later with your own editing software. Instant Video Presenter works as advertised, and anyone should be able to use it with almost zero learning curve even if they are not video or computer-savvy. While many users will be satisfied with the basic 5’ x 7’ green screen included, there are different packages available that include larger backdrops and even a high-quality webcam if desired. If your intention is to produce music videos or do video compositing work in your nonlinear editing software, then this may not be the right solution for you. IVP is meant for quick and easy live, one-shot recording of presentations, and is ideally suited for that purpose. If that’s your goal, then you should be very pleased with Internet Video Presenter. Just today, as I was completing my review, I got an email announcing a free upgrade to the 1.3 version of the application, which I checked out. They’ve been listening to customers and added several new features to improve the user experience. The upgrade includes reduced lag time when recording, better YouTube compatibility, smoother video quality, and several new graphic backgrounds with a corporate feel. Just when I thought it couldn’t get any better, it just did!